Xbox co-creator Seamus Blackley has warned about a "generation gap" in game developers and says the industry needs to find new ways to discover and nurture its future talent. "There's a whole generation of games designer that is is absent. It's like the World War One 19-year-olds, they've vanished. The Will Wrights, the Warren Spectors, the Sid [Meiers], the Tim Schafers - we can give those guys what they want, and do large deals for them. But there is no generation after them," Blackley said at the 2009 GamesBeat conference. He described the current method of discovering talent as like "taking three great graduates and putting them to work on the next Godfather game," which he said squanders their potential. "That [approach is] a fine business decision, but the perspective for us is that it is a much better idea to take these three guys who perhaps have a beautiful idea and a different way of working, protect them a little bit as they build up a new idea and a new way of looking at things and a new way of design - and a few years from now they will be a much better business," he added. "In the '90s there was no mechanism to do that - and we lost a generation of designers. I think its important we look to reclaim that new generation." 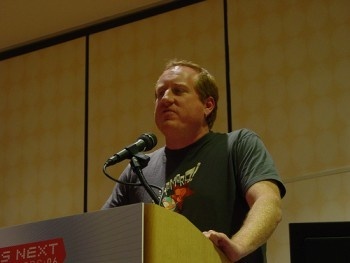 Blackley was heavily involved in the design and marketing of the original Xbox, after which he left Microsoft and co-founded the Capital Entertainment Group with the intent of changing the game industry financing model in order to give more creative control to individual developers. CEG went under in 2004 and Blackley now represents game developers at the Creative Artists Agency, a high-end talent agency with clients including famous actors, athletes and industry figures like Ken Levine and Will Wright. He said that in order to continue growing the industry had to ensure that it didn't "oppress" new talent by becoming locked in to bad habits. "Great projects happen when a lot of people put a lot of effort into making them happen," he said. "Previously these happened organically but as the model matures and the industry around that matures people become set in their ways."